The mineral that everyone knows as "salt"
Halite: Halite from Retsof, New York. Specimen is approximately 3 inches (7.6 centimeters) across. Halite is the mineral name for the substance that everyone knows as "salt." Its chemical name is sodium chloride, and a rock composed primarily of halite is known as "rock salt." Salton Sea Halite: Halite from the Salton Sea, California. Specimen is approximately 4 inches (10 centimeters) across. 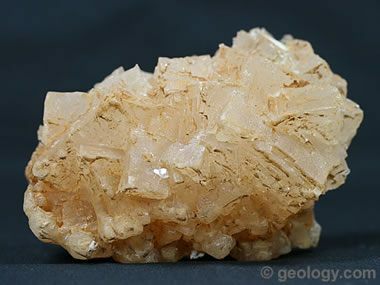 Halite is mainly a sedimentary mineral that usually forms in arid climates where ocean water evaporates. However, many inland lakes such as the Great Salt Lake of North America and the Dead Sea between Jordan and Israel are also locations where halite is forming today. Over geologic time, several enormous salt deposits have been formed when repeated episodes of seawater evaporation occurred in restricted basins. Some of these deposits are thousands of feet thick. When buried deeply they can erupt to form salt domes. Salt has many uses. Most of the salt produced is crushed and used in the winter on roads to control the accumulation of snow and ice. Significant amounts of salt are also used by the chemical industry. Salt is an essential nutrient for humans and most animals, and it is also a favorite seasoning for many types of food. Salt is a mineral that everyone knows. 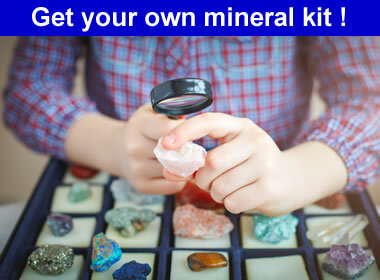 The best way to learn about minerals is to study with a collection of small specimens that you can handle, examine, and observe their properties. 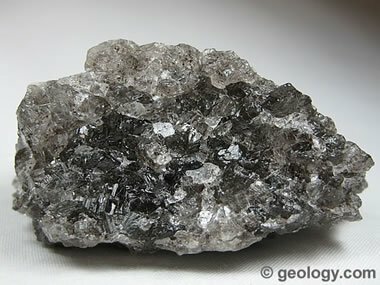 Inexpensive mineral collections are available in the Geology.com Store. 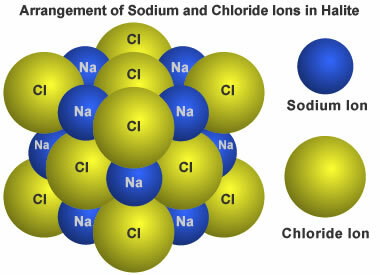 Halite structure: This diagram shows the arrangement of sodium and chloride ions in a crystal of halite.